An all natural SPF 15 moisturiser using just natural clear Zinc. Why do we Make a Natural SPF 15 Moisturiser? A natural SPF 15 cream still provides very good sun protection (SPF 15 means 94% of UV blocked) whilst not requiring as much clear Zinc and other ingredients so that it has better skin feel. SPF above 15 provides diminishing returns as explained below. Our Coverup Buttercup is natural and healthy for the skin and provides long lasting protection without using UV Filters or penetration enhancers. There are two main types of sunscreens. Firstly, natural sunscreens that use Zinc Oxide or Titanium Dioxide as a physical barrier that reflect the sun. The second type use "UV Filters" that absorb high energy UV radiation and emit low energy radiation. Like a hat or shade, a cream containing the Zinc Oxide reflects the UV radiation away. Most Zinc Oxide barriers block both UVB and UVA. Zinc Oxide would normally be white on the skin. We use a special type of Zinc Oxide that is made here in Australia that is dispersed within Jojoba Oil which helps make it clear and non-greasy. Like a hat or shade, they simply reflect the UV radiation away. As a physical blocker, Zinc Oxide naturally reflects both UVA and UVB. These are various chemicals that absorb high energy UV radiation and re-emit it as low radiation. Sunscreens are "therapeutic products" and so their safety or efficacy cannot be questioned. The way to get information is to spend 15 minutes doing your own research to help choose the right sunscreen for you. Wikipedia, although not always accurate, has a very good page on sunscreen and well worth getting the facts. Try and read at least from half way down the page. Link to Wikipedia on Sunscreen here. (Bear in mind that up to 2/3rds of Australians are Vitamin D deficient. Only around 15 minutes of sunshine is required 2-3 times a week for the average person to obtain correct amounts of Vitamin D). We have chosen only to use clear zinc oxide in a cream that is designed to be a natural moisturizer. We also wanted a natural non-greasy cream that can be used on infants and adults every day. This is personally what we prefer to use at home. But making a cream this way does mean some compromise in the amount of SPF that can be achieved. SPF 15 will provide protection for 4 hours for someone who would normally burn in 15 minutes. Because it is based on the Full Cream moisturiser, it is very healthy for the skin, not packed with chemicals. It is of course perfect for babies. Just apply the cream as a moisturiser before going into the sun. All natural products should be patch tested before use. Perfect for infants as well as adults. Hi, I received your order the other day and yesterday my son and I went to play group with an animal show and then water themed activities outside in the sun with 32 deg temps. I covered my 2year old and myself with Coverup buttercup and I am totally amazed with the results. Being an SPF 15+ I was not sure. We were out in the sun and water for almost two hours and neither of us got burnt or even red. It was lovely to put on being a moisturiser, and it soaked in and I loved using it on my son knowing they consisted of edible ingredients. I got some red burn marks but that was because I missed a spot when applying it! Oops. Thanks for such a great product which makes me confident using it on my young family. 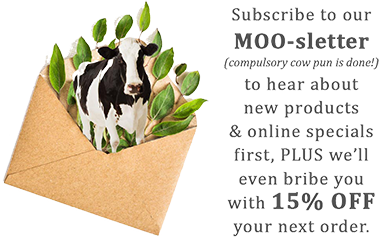 Note from MooGoo: We didn't design Buttercup to be waterproof as that would mean an oily waterproof film on the skin which is something we don’t like the feel of. Aqua (H20’s Fancy Name), Zinc Oxide, Simmondsia Chinensis (Jojoba) Seed Oil, Squalane (Olive), Coco-Caprylate (Coconut Based Conditioner), Glyceryl Isostearate, Aloe Barbadensis Leaf Juice (Aloe Vera), Polyhydroxystearic Acid (Emulsifier), Cetearyl Glucoside & Cetearyl Alcohol (Plant Based Emulsifiers), Tocopherol (Natural Vitamin E), Piroctone Olamine (Olamine Salt), Rubus Idaeus (Raspberry) Seed Extract, Cyamopsis Tetragonoloba Gum (Guar Gum), Allantoin (Comfrey Root Extract), P-Anisic Acid (Anise Derived Preservative), Potassium Sorbate (Natural Preservative), Hyaluronic Acid (Retains Moisture), Glyceryl Stearate, Ceteareth-20 & 12 & Cetearyl Alcohol & Cetyl Palmitate (Emulsifiers), Humulus Lupulus (Hops) Extract.